^ The Generic Names of British Insects. Royal Entomological Society of London Committee on Generic Nomenclature, Committee on Generic Nomenclature. British Museum (Natural History). Dept. of Entomology. 2007-05-23: 20  [2008-06-04]. ^ 4.0 4.1 australian museum online. Wanderer or Monarch Butterfly. [2008-06-27]. （原始内容存档于2008-07-22）. ^ Monarch, or wanderer, butterfly (Danaus plexippus) photographed at Calamvale Creek, Brisbane, Queensland, Australia. [2008-06-27]. ^ 6.0 6.1 Garber, Steven D. The Urban Naturalist. Courier Dover Publications. 1998: 76–79 [2008-05-26]. ISBN 0486403998. ^ 7.0 7.1 Peter J. Bryant. Monarch, Danaus plexippus. [2008-06-27]. （原始内容存档于2012-12-15）. ^ Jean, Adams. Insect Potpourri: Adventures in Entomology. CRC Press. 1992: 28–29 [2008-05-21]. ISBN 1877743097. ^ Pyle, Robert Michael. Chasing Monarchs: Migrating with the Butterflies of Passage. Houghton Mifflin Books. 2001: 148–149 [2008-05-14]. ISBN 0618127437. ^ Egmont, W. & Kirby, M.D. (1896). Butterflies and moths of the United Kingdom. George Routledge & Sons LTD, London. ^ Vane-Wright, Richard I. The Columbus Hypothesis: An Explanation for Dramatic 19th Century Range Expansion of the Monarch Butterfly. Stephen B. Malcom and Zalucki, Myron P., Eds. 1993. 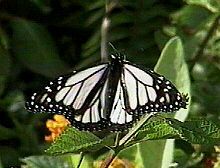 Biology and Conservation of the Monarch Butterfly. From, the 2nd International Conference on the Monarch Butterfly. Natural History Museum of Los Angeles County. Los Angeles, CA.Pp.183-185. ^ 15.0 15.1 15.2 Braby, Michael F. Butterflies of Australia: Their Identification, Biology and Distribution. CSIRO Publishing. 2000: 597–599 [2008-05-26]. ISBN 0643065911. ^ Gugliotta, Guy. Butterflies Guided By Body Clocks, Sun Scientists Shine Light on Monarchs' Pilgrimage. Washington Post. May 23, 2003: A03 [2006-01-07]. （原始内容存档于2006年3月5日）. ^ 19.0 19.1 Ethan Kane. Danaus plexippus. Animal Diversity Web. 1999 [2008-06-30]. ^ Official Alabama Insect. Alabama Emblems, Symbols and Honors. Alabama Department of Archives & History. 2001-07-12 [2007-03-19]. 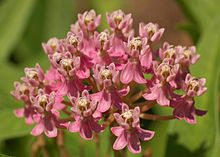 ^ Idaho Symbols, Insect: Monarch Butterfly. Idaho State Symbols, Emblems, and Mascots. SHG resources, state handbook & guide. [2008-03-26]. 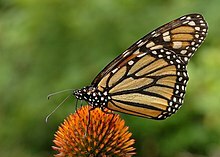 ^ State Symbol: Illinois Official Insect — Monarch Butterfly (Danaus plexippus). [Illinois] State Symbols. Illinois State Museum. [2008-03-26]. ^ Minnesota State Symbols (PDF). Minnesota House of Representatives. [2008-03-26]. ^ Texas State Symbols. The Texas State Library and Archives. [2008-03-26]. ^ (Vermont) State Butterfly. Vermont Department of Libraries. [2008-03-26]. （原始内容存档于2008-05-18）. ^ West Virginia Statistical Information, General State Information (PDF). Official West Virginia Web Portal. [2008-03-26]. （原始内容 (PDF)存档于2008-04-11）. ^ Wade, Nicholas. Choosing a National Bug. The New York Times. 1990-06-01 [2008-03-26]. ^ Frequently Asked Questions on Entomology. Entomological Society of America. [2008-03-26]. （原始内容存档于2008-03-31）. 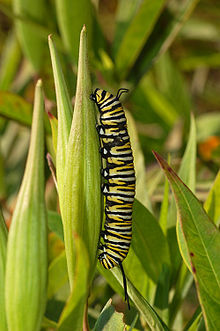 ^ Monarch Watch. The Kansas Biological Survey, Univ of Kansas. 2008-05-27 [2008-05-27].